The afternoon flight from Bangkok to Amsterdam got us to our destination at slightly after 8.30 pm on a Thursday night – 2 hours past the kids’ bedtime. They both were so knackered that they nodded off almost instantly the moment they were belted-into their respective car seats. They didn’t bother with any protests when we put them to their newly assigned beds after their shower. Jet-lagged was to be expected. Both Spud and Squirt were restless throughout the night and between the both of them, they probably woke us up 10x that very first night. I can’t quite recall what we did in the first few days and with nothing actually planned for the first few days we were there, we took it real slow. We did things on the fly. 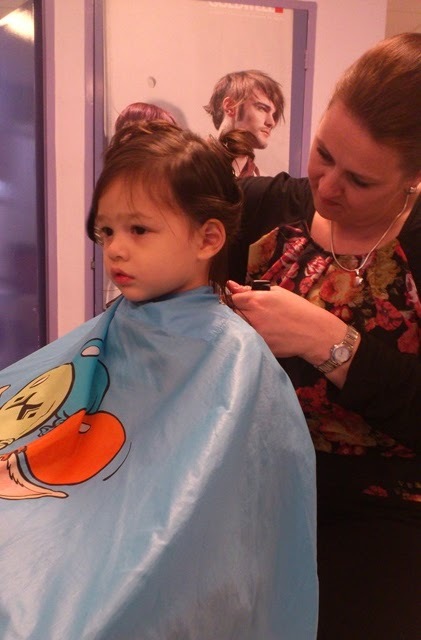 To fight off jet-lag and to get ourselves synched in with the new rhythm of time, we do anything and possibly everything we could to keep us awake; one of which included giving the kids their first professional haircut on the first morning we were there. At a professional salon. Spud took it like a champ – she sat still throughout the entire session and listened to instructions well. Although she did not like the sound of the hair-dryer too much (scary, she said! ), I think that she enjoyed the overall experience! We had some visitors over the next few days, and the kids have, once again been able to meet their great-grandparents who are already approaching 90 years old. It was really heart-warming to see them interacting together. While we had spent most of our time chilling out, we also got busy with a little preparation that needed to be done for a trip to a holiday bungalow in the Northern part of Holland for the week to come. This time, the drive to the holiday bungalow was only an hour-half long; not half as long as the previous one we went to.